In reply to your letter of July 20th, I wish to say that the cause of Mr. Wilson’s death, as certified by me in the Certificate of Death, was “general arterio-sclerosis with hemiplegia”, the contributory cause being “asthenia”. Mr. Wilson was ill four years and four months. 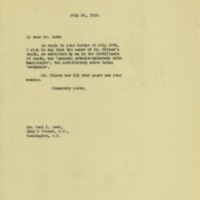 Grayson, Cary T. (Cary Travers), 1878-1938, “Cary T. Grayson to Paul E. Lesh,” 1925 July 28, WWP16593, Cary T. Grayson Papers, Woodrow Wilson Presidential Library & Museum, Staunton, Virginia.